The Electrocorder range is designed to allow cost effective monitoring of electrical supplies. The EC-2VA is designed to allow engineering staff to monitor single-phase Voltage and Current (up to 300A). NOTE: RS232 connection, please order USB Adapter Cable from "Recommended Products" below if required. For smaller currents (up to 60A), please refer to the CT-2VA Energy Logger. UK Mains plug shipped as standard, other's available on request. 300Vac & 300Aac single phase voltage & current logger. Ideal for domestic and industrial logging. 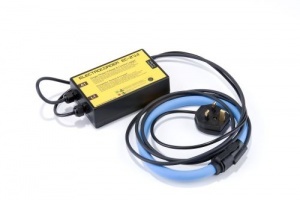 Complete with serial lead, Voltage Lead, 300A Current sensor & free Electrosoft software. Up to 75 days continuous recording. Records true RMS Vavg, Vmax & Vmin to 2%. Records true RMS Iavg, Imax & Imin to 5%. Selectable averaging period to suit each situation, accurate to +/-2% of reading. Prints dispatch & return documentation. Allows rapid response to complaints & issues.